Oh always such an enjoyable visit here! I LOVE your kitchen. 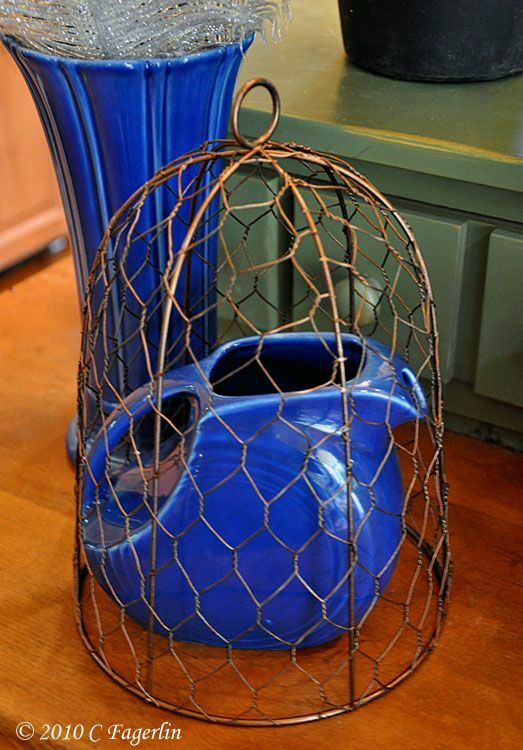 I love the chicken wire cloche! Yes, the blue is a nice change from the Red and Green...even though it was peppered with lots of other colors...all BTW...enjoyed so much and found very inspirational! Thanks for all the wonderful posts and great ideas in 2011. I'm looking forward to more in 2011...Happy New Year, Candy! Also, Happy Anniversary on the 28th...I enjoyed seeing your wedding pictures from 1963. My Anniversary was December the 27th...HiHoney and I were married in 1965, and I posted about our 45th Anniversary, too! So beautiful as always! I am so impressed with how you do this. I love the red, blue, white combinations. It may be winter, but the red reminds me of spring. 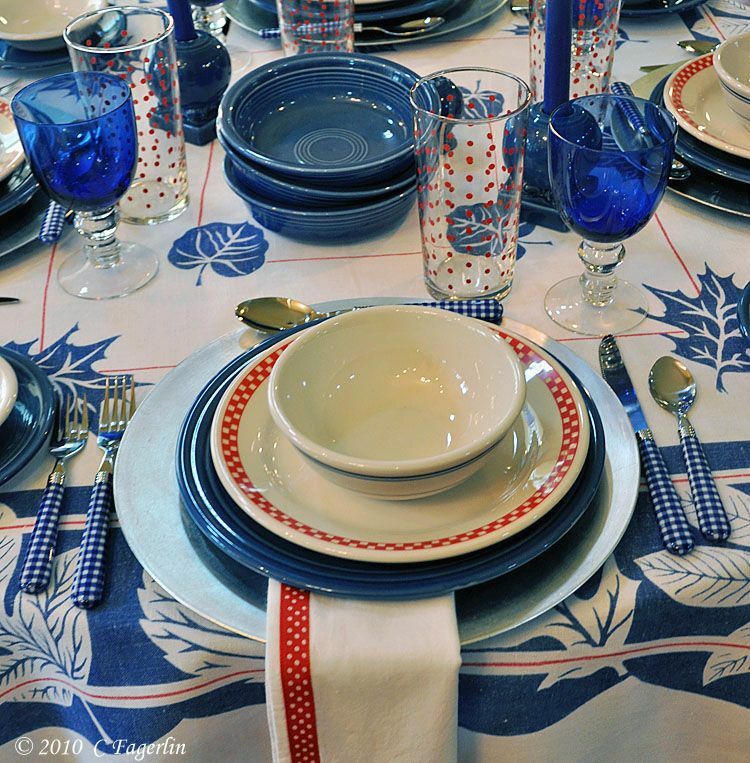 How pretty your red-white and blue tablescape is. Love your pretty collection of pitchers! 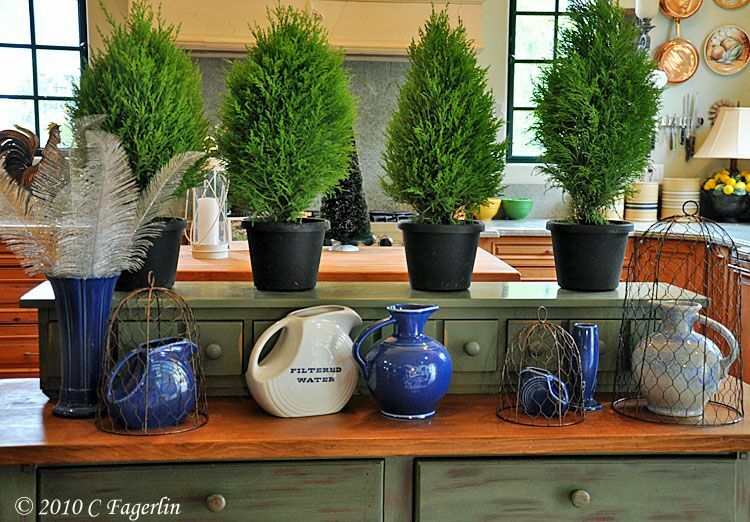 Love the blue and red together and the evergreens on the counter are fantastic. Thanks for sharing. Love all of the blue. As much as I love the red and green, the blue is so refreshing. 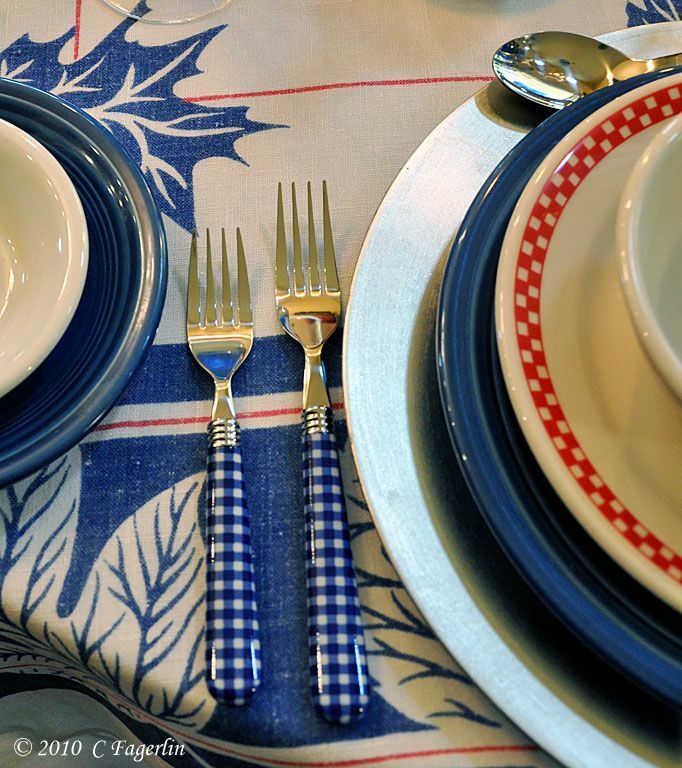 Love the gingham flatware!!! 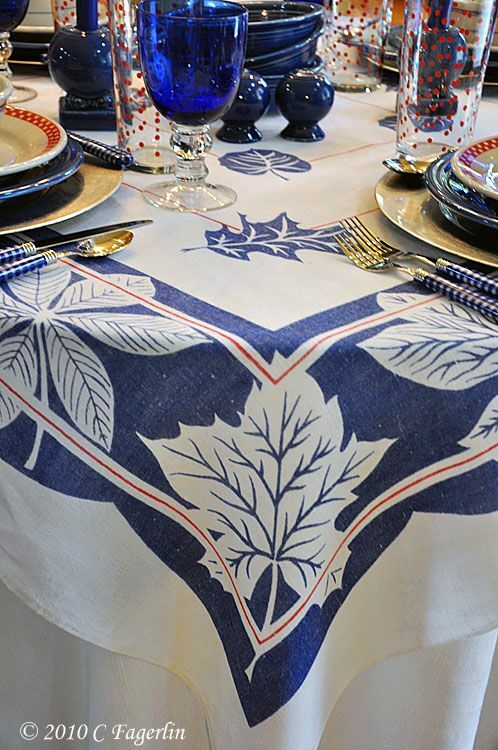 Great fun to see your blue and white with a touch of red... Lovely tablecloth. Happy New Year to you and yours, may the new year bring lots of blessings! Wow! I don't know what else to say other than...wow! 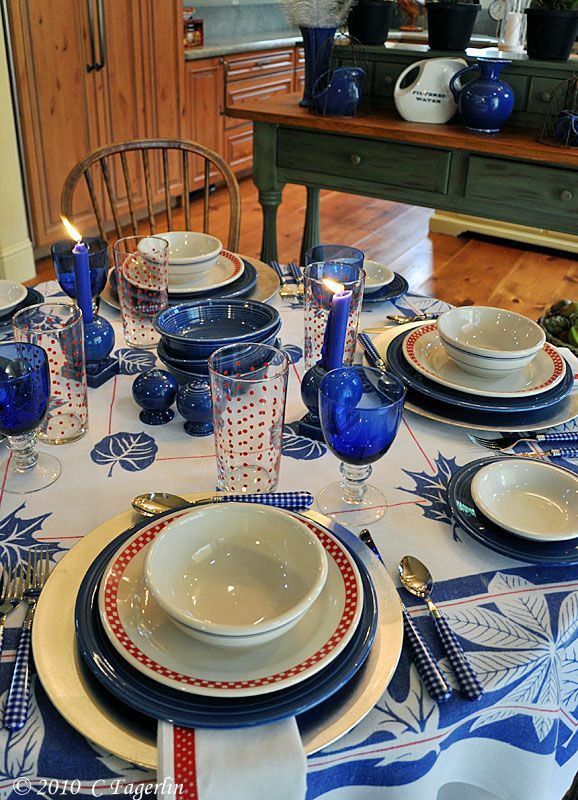 You can never go wrong with red, white and blue - what a fresh setting! Very pretty! I like that little kiss of red in there. Cool! So very pretty and awesome. Wish you a very happy and peaceful new year! 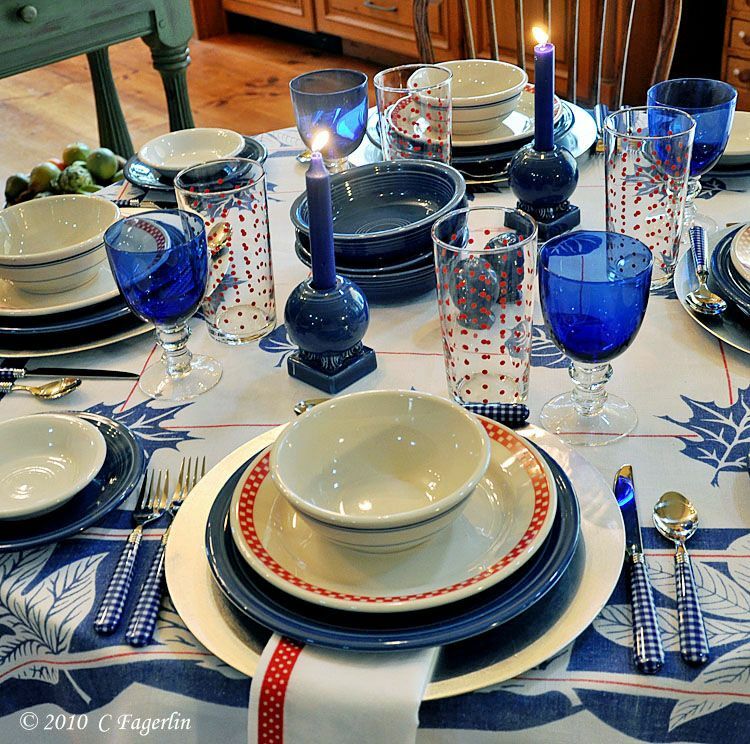 Your tablescape is absolutely beautiful. I love that you used the deep blue in winter! 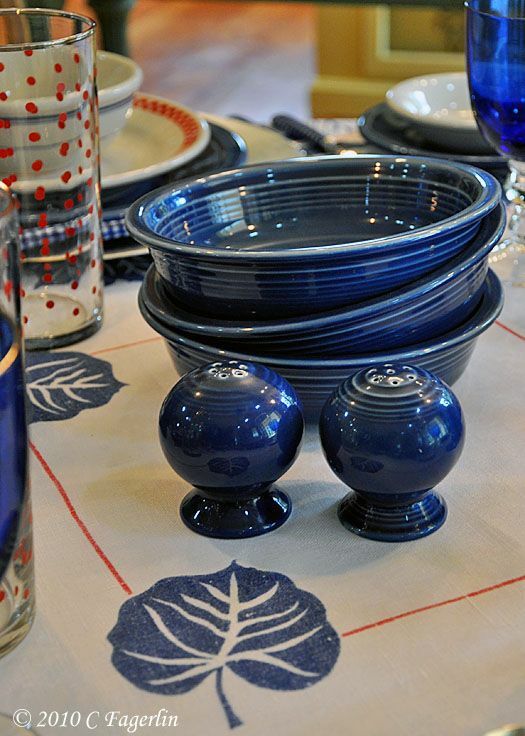 What a great-looking tablescape. I especially like how you managed to get the glassware to match. This is a beautiful blue winter setting.....here in the northeast in winter, at dusk, the skies are a rich blue, it is my favorite time.....happy new year!! Blue just satisfies at this time of year, doesn't it? 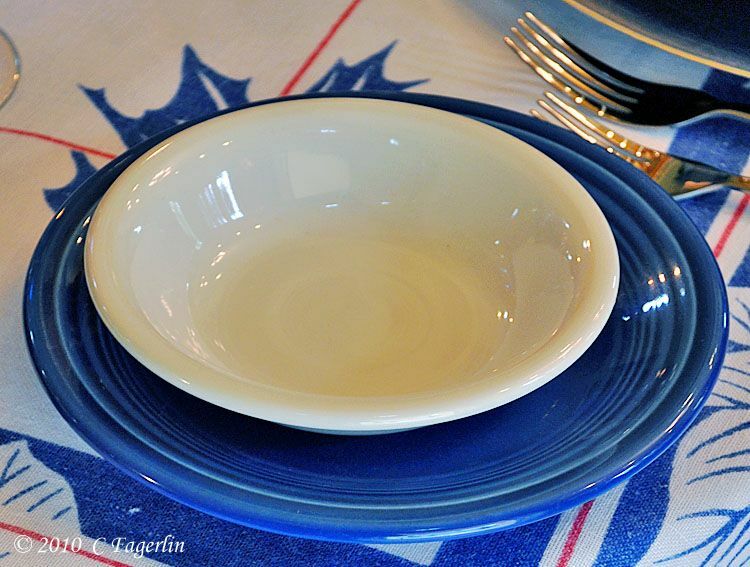 The TC and flatware are great...a totally new setting for the diner dishes. 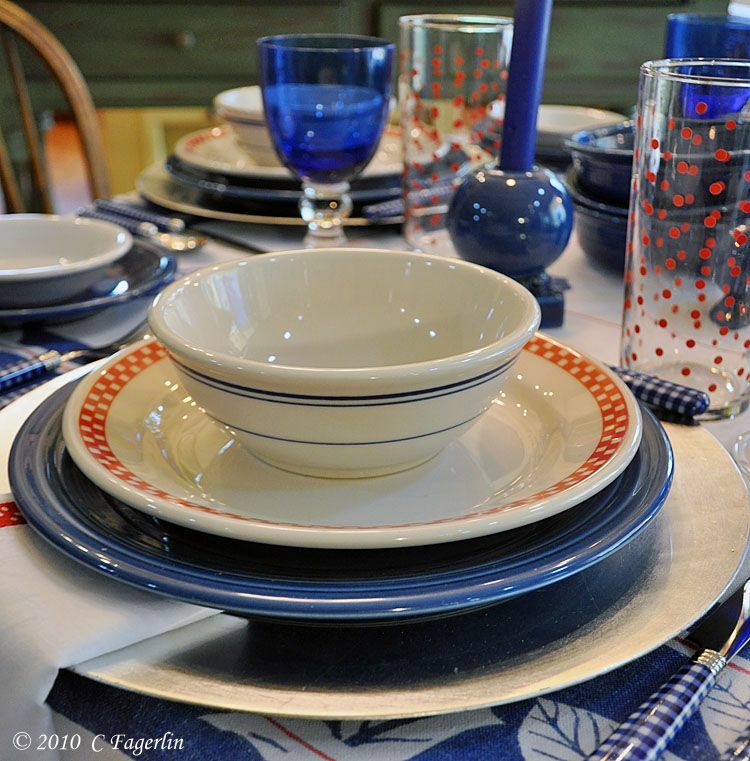 Thanks for all the tablescape fun in 2010! I'm being a slug this morning..... it's darn COLD here this morning and my guess is that it is headed east for all of you who have been suffering with the cold and snow. 37F here is pretty darn cold! So, I'm curled up by my desktop with the space heater .... thinking of moving to the fluffu pink blanket on the couch pretty soon! As always, you set a beautiful table! And your kitchen is just fabulous! Loved all your table. Just gorgeous. Hope you and yours have a Healthy and Happy New Year. I can never decide if I like your kitchen or your table the best. 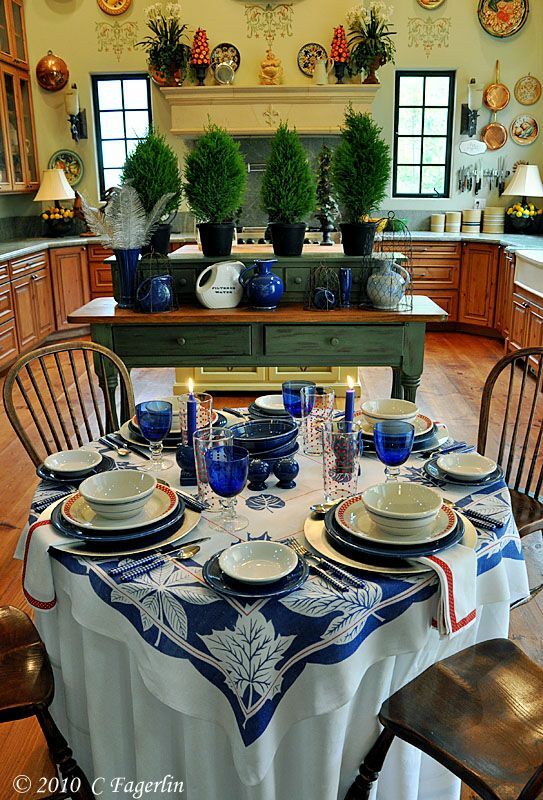 You have such a lovely kitchen and your tables are always outstanding. 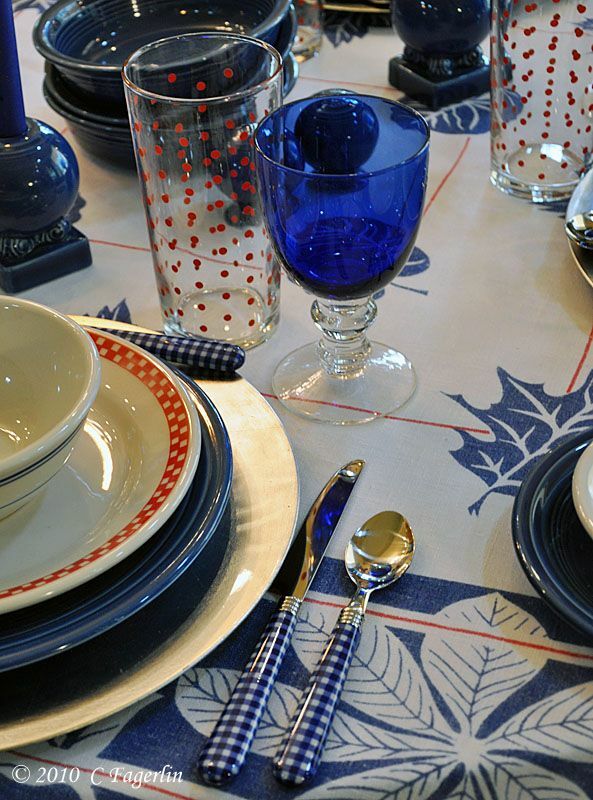 The blue and white table with a touch of red is so friendly and homey. I would love to join you at this table! Thanks everyone for stopping by to visit! I did get a New Year's table done, but not much else in the last couple days. This old girl is about partied out! Amazing. 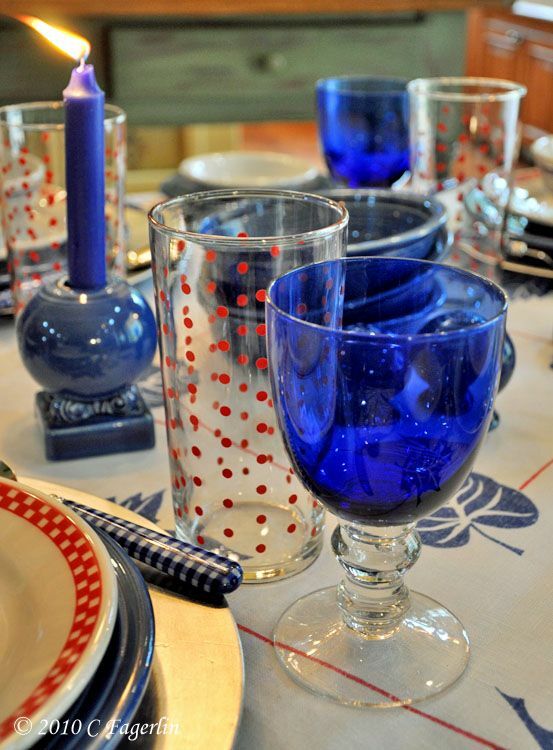 That tablecloth and polka dot glasses add such an unexpected touch to this fun and whimsical table scape! I hope you're resting up from a holiday season extraordinaire! You certainly are the hostess with the mostest, girl! 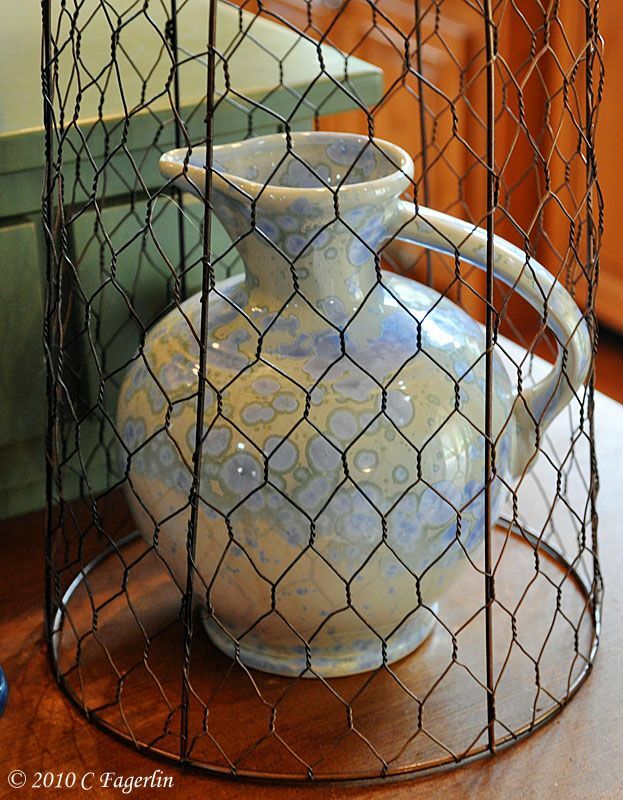 Thanks for sharing your lovely decorating talents with us. It is always so fun to visit you. I've never see flatware like that. I love it! i'm in awe, can i just marvel at your beautiful collections? on a harsh snowstorm, i would just want to sit at your lovely table and have a tea! 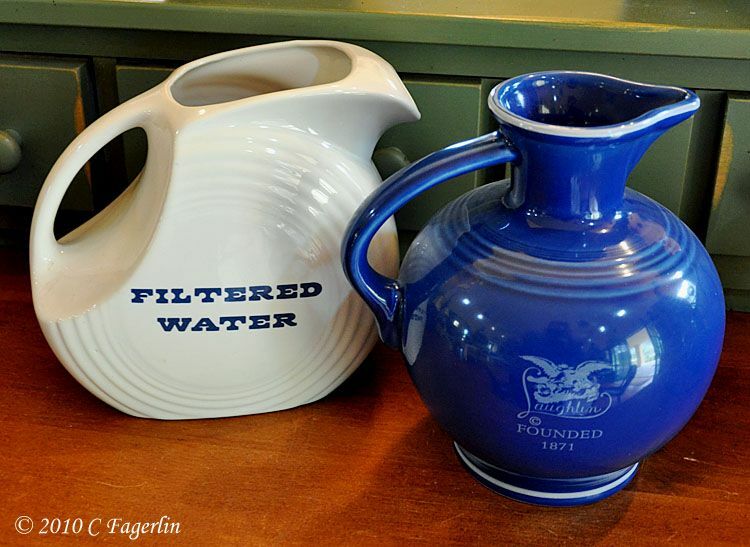 You have a lovely home filled with pretty blues. 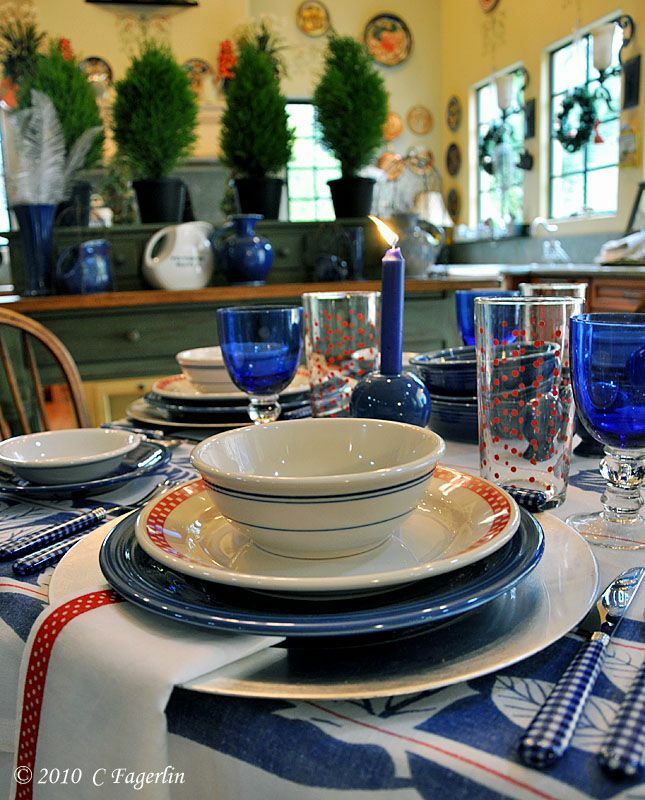 That is a gorgeous table setting. They are so pretty i like all your blues...Happy blue Monday. Thanks ladies! 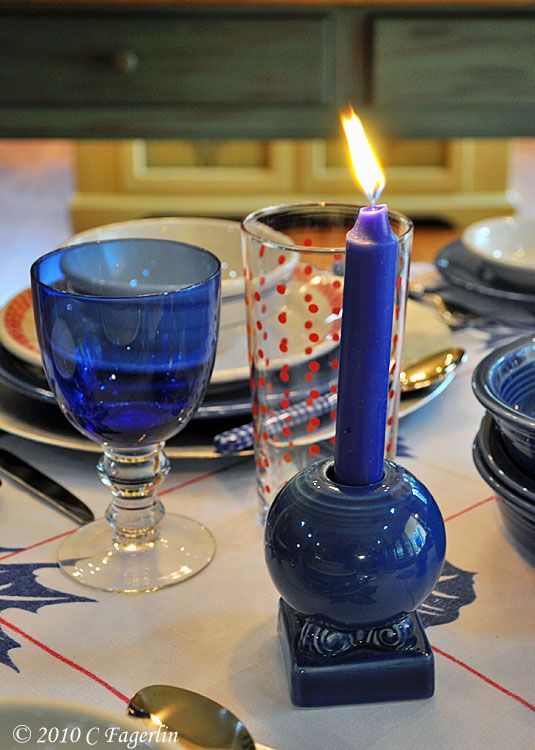 I do think blue works so well for a post Christmas table, cheery but bright enough to dull the gloomy weather we've been having! 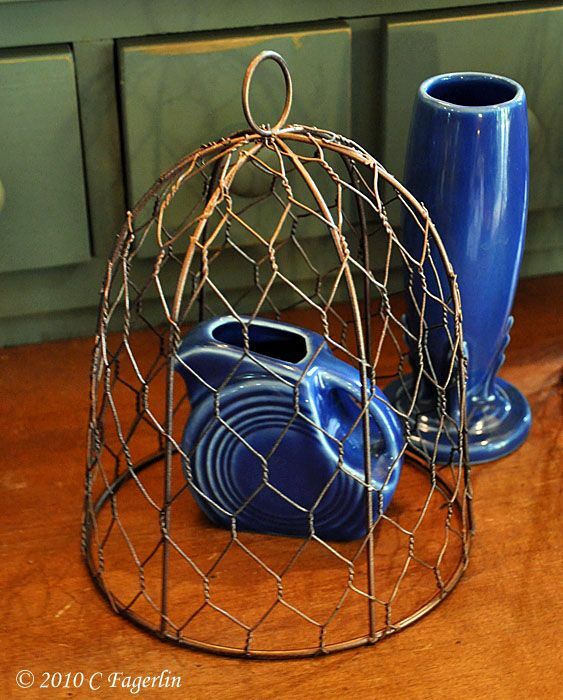 Love all the blues especially the sapphire pieces. I started with all the Fiesta purples for my first post Christmas table. I might have to work a blue table soon. 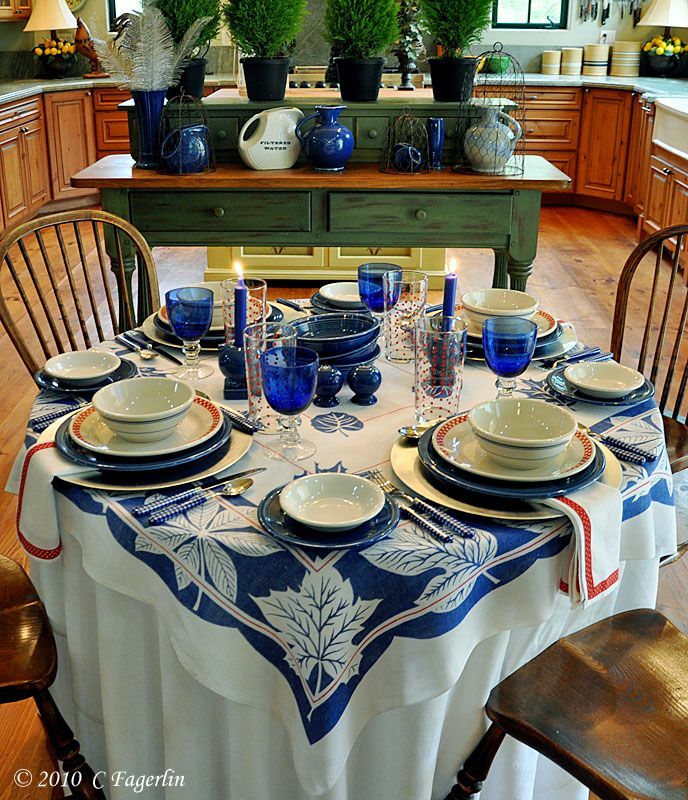 Blue is a welcome addition to The Little Round Table, not my first choice when I am choosing colors, but it always works on the tables and continually amazes me with how it appeals to all kinds of sensibilities.